California Livin Home: It's ALWAYS Grillin' time in Southern California! It's ALWAYS Grillin' time in Southern California! My husband and I love to grill. We must grill at least 4-5 times a week, all year round. When you live in a Mediterranean climate like ours here in Orange County, your oven is rarely used and your grill is always hot and ready to go! Tonite is Taco Nite, Baja Light Fish Tacos. They are so yummy I have the recipe below. One of my favorite magazines (I subscribe to) is SUNSET. I got this recipe from the September 2010 issue. Now go fire up the grill! Grilled instead of deep-fried, and with a trimmed-down tartar sauce. 1.Heat grill to high (450-550). Combine seasoning in a small bowl. Set fish on a rimmed baking sheet. Rub all over with oil, then sprinkle with seasonings. Oil cooking grate, using tongs and a wad of oiled paper towels. 2.Grill fish, covered, turning once, until just cooked through, 4 to 6 minutes total. Break fish into large chunks. 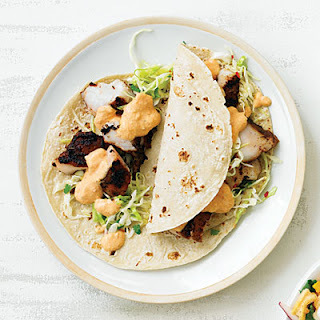 Fill tortillas with slaw and fish. Serve with tartar sauce. Put 3 tbsp. lime juice, 2 tbsp. vegetable oil, 1/4 tsp. red chile flakes, and 1/2 tsp. kosher salt in a large bowl. Just before serving, toss with 1 bag (10 oz.) very finely shredded cabbage and 1/3 cup chopped fresh cilantro. Seed and devein 2 tbsp. canned chipotle chiles (hispanic food aisle at Safeway); rinse. in a blender, puree chiles, 8 oz. (1 cup) plain low-fat Greek yogurt, 1/4 cup sweet pickle relish, and 1/4 cup chopped onions. Jewel of the Seahorses * Outdoor Pillow Covers! Shopping Southern California Style in the OC ! Coastal Casual Shoes - In MY size! Pretty Paper's make Prettier Wall Art! It's Garden Time! -*-*- Roger's Gardens!